The very first time we reviewed a PCIe SSD, we were blown away by the speeds we were able to achieve. PCI Express (PCIe) is the backbone of a PC, shuttling data between the processor and all other components. Hooking storage up to it directly and cutting out the middlemen is an expensive but incredibly effective way of improving data transfer speeds. Most common SSDs are designed to the same standards as spinning hard drives in order to be compatible, but that imposes restrictions on their performance – their 2.5-inch bodies are often only half full of components, they use the same SATA protocol which maxes out at a theoretical 600MBps, and they’re saddled with overheads that just aren’t needed anymore. That said, SATA SSDs are still a lot faster than hard drives and perform well enough for pretty much any casual PC user. It’s only if you want the absolute best that money can buy, that you should seriously think about ditching SATA for PCIe. 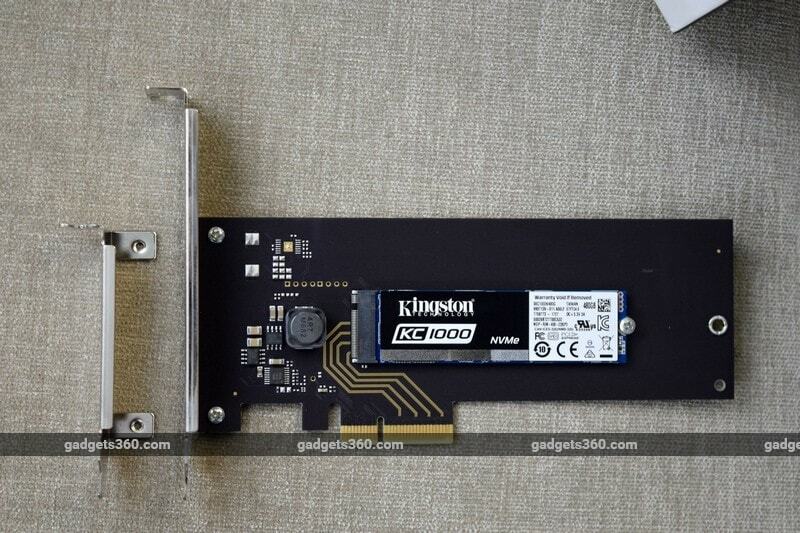 One of the simplest ways to implement a PCIe SSD is to simply mount components onto a PCIe expansion card, since PCIe slots that are standard on every motherboard that’s shipped in the past decade or so. With pretty much everything either integrated onto motherboards or plugged in externally via USB, PCIe slots often lie unused. There are also other options, the most common being the M.2 standard for finger-sized cards that slot right onto your motherboard, delivering all the benefits of PCIe connectivity and no dangling cables in a much smaller package. M.2 is already quite popular – slots have been a common sight on motherboards for at least the past two years, and the drives are easily available. 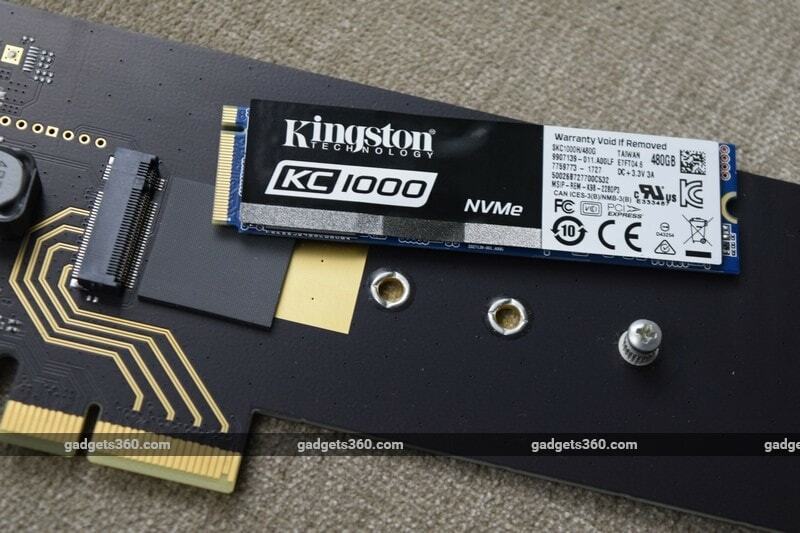 Kingston has gone with a hybrid approach, shipping its new premium KC1000 SSD as an M.2 stick mounted to a PCIe adapter. 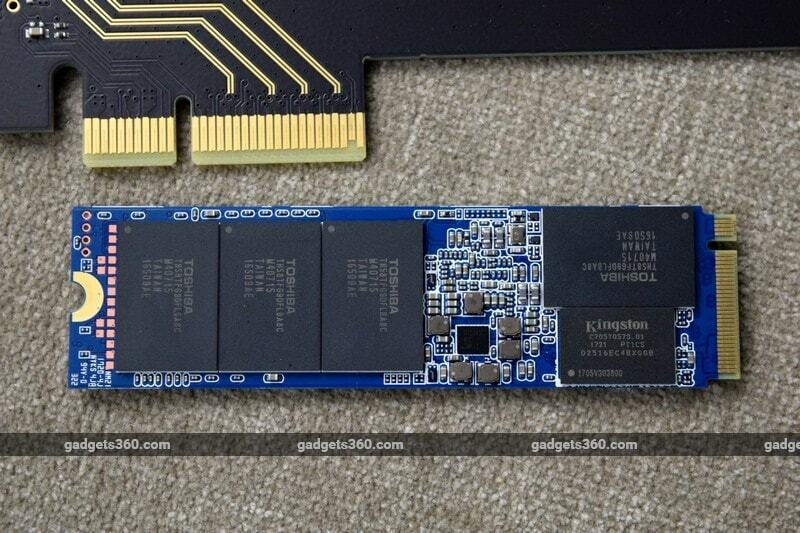 Everything that makes the drive work is on the M.2 module and you can pop if off and use it on its own if you prefer – Kingston sells just the SSD for a little less in other countries, but only this kit version has been launched here in India. The adapter is clearly multi-purpose, with mounting holes for M.2 cards of various lengths. The M.2 module on its own weighs a mere 10g. As with all such devices, is extremely thin and easy to snap accidentally, so it needs to be handled with care. The adapter has a PCIe x4 connector, which makes sense as SSDs use four PCIe lanes. It will fit and work just fine in a PCIe x16 slot. It’s half-height and half-length compared to a standard-sized graphics card, which is good because it won’t impede airflow inside your PC cabinet. You also get a second smaller rear bracket which can be swapped onto the card with two screws, for use in low-profile cabinets. The only other thing you get with the KC1000 is a code for activating one copy of Acronis True Image HD, a tool that lets you clone the contents of one drive onto another. This could help you manage an upgrade easily but does not have most of the features of the well-known Acronis True Image, such as incremental file and folder backups, cloud syncing and ransomware protection. In terms of specifications, the KC1000 uses Toshiba’s planar MLC flash, not the cheaper, denser stacked TLC variety that’s common across most consumer drives today. You can get it in 240GB, 480GB and 960GB capacities. Because of the increased parallelism possible with more physical chips, the higher capacity models have higher speed ratings. Our 480GB review unit is rated for 2700MBps sequential reads and 900MBps sequential writes. Durability in terms of Total Bytes Written (TBW) is claimed to be 550TB which means you should be able to cumulatively use the drive for that volume of writes before failure is likely. Another measure published by Kingston is DWPD or Drive Writes Per Day. Kingston claims a figure of 0.7 for the 480GB model, which means you should be able to write 70 percent of 480GB (336GB) per day for the duration of the warranty period (five years) without any failures. Kingston is clearly aiming this drive at enthusiasts and professional users. Compared to the entry-level Kingston A400 SSD we reviewed recently, peak speeds are nearly five times higher and durability is over twice as much. Cache memory is one of the first things to be cut on low-end SSDs, but Kingston boasts of “2X DRAM” with the KC1000, though doesn’t clearly state how much that is. The maximum power consumption is 7.4W in use and 0.11W when idle. The only thing that could be considered lacking about this drive is that it has no heatsink. A lot of native PCIe SSDs do have at least some form of a heat spreader, and many motherboards boast of similar arrangements for their M.2 slots. Kingston warned us that “performance will waiver” if the drive exceeds 70 degrees Celsius. Heavy users should make sure that their case fans provide adequate airflow over this card. As we do our testing with open-air rigs, we did not have any heat-realted problems. We tested the KC1000 with the brand new Intel Core i9-7900X ‘Skylake-X’ processor (Review), because one of its key features is direct PCIe connectivity between itself and storage devices thanks to a greatly expanded number of PCIe lanes compared to mainstream platforms. We used an Asus ROG Strix X299-E Gaming motherboard (Review), 32GB of Corsair Vengeance LED DDR4 RAM, a Samsung SSD 950 Pro reference drive (Review), a Cooler Master MasterLiquid 240 cooler, and a Corsair RM650 power supply. We were running the latest release of Windows 10. We used the drive both in its PCIe adapter as well as plugged directly into an M.2 slot. Interestingly, our first set of tests used a PCIe x4 slot on the motherboard and returned numbers far below the rated maximum speeds – it’s possible that this is because the x4 slot could be fed by the X299 platform controller and not the CPU directly. Swapping into a neighbouring x16 slot cleared that up right away, but blocking that slot is a waste of platform bandwidth. CrystalDiskMark 5 reported 2.807GBps sequential reads and 1.616GBps sequential writes using a queue depth of 32 which saturates the controller. This is a good way to show how far an SSD can be pushed in the most favourable conditions, but doesn’t necessarily reflect real-world performance. A better measure is random reads and writes, which came in at 968.7MBps and 927.7MBps respectively. With the M.2 module plugged directly into our X299 motherboard, we saw a similar sequential read speed of 2.764GBps but an anomalous drop in the sequential write speed to 968.9MBps, as well as drops in the random read and write speeds to 714.5MBps and 748.1MBps respectively. What we see from these numbers is that the Kingston KC1000 can certainly reach its rated top speeds, and that performance will depend on what kind of PC the drive is installed in. The flexibility of the PCIe adapter card means that you can try multiple setups and see what works best for you. Regardless, these are the highest speeds we’ve ever seen for an SSD, easily topping those of the Samsung SSD 950 Pro which is now nearly two years old. Kingston says that you can expect over twice the performance of a standard SATA SSD, and over 40 times as much speed as a 7200rpm hard drive can manage. Any machine you build around a KC1000 PCIe SSD will boot lightning-fast, and you won’t have the usual headaches waiting for heavy files and programs to load. If your work involves video editing, content creation or heavy databases, this could change your life. If you’re an enthusiast or gamer who gets a thrill from high-performance hardware, you’d be proud to own and use an SSD like this – or an array of them. However, this kind of speed comes at a price. The 240GB has an MRP of Rs. 16,000 while the 480GB and 960GB versions will set you back by Rs. 26,000 and Rs. 51,000 respectively. Street prices for the 240GB and 480GB versions are Rs. 1,000-2,000 lower at the most, but the 960GB one sells for almost Rs. 8,000 less online. There are loads of options that cost a lot less, and the differences in speed between a mainstream SSD and the KC1000 won’t be worth so much to a lot of people. On the other hand, if you’re spending a few lakhs on a Core i9 processor and top-end motherboard, this is exactly what you need to keep the beast fed. Our sole complaint is the lack of a heatsink – which is the tradeoff for the simplicity of the PCIe adapter design. If your PC tends to run hot, you might want to check out other options. Toyota’s Trying to Remain Non-threatening in the U.S.